1) Who should read this book? This book is for adults, study groups, pastors and church leaders. Spirituality is a major focus in our society today. On the one hand, people who are curious about the faith journey and don’t quite know where to begin. On the other, those who are looking for affirmation and permission for their doubts and heresies. Tension in the Tank offers meaningful guidance for both groups. Many people are looking for voices of spirituality that are easily accessible and that honor and respect traditional religion while not being bound to rigid creeds and dogma. They often feel spiritually marginalized. This book provides a framework for individual exploration, meditation, and action, while also serving as an effective tool for community study and discussion. 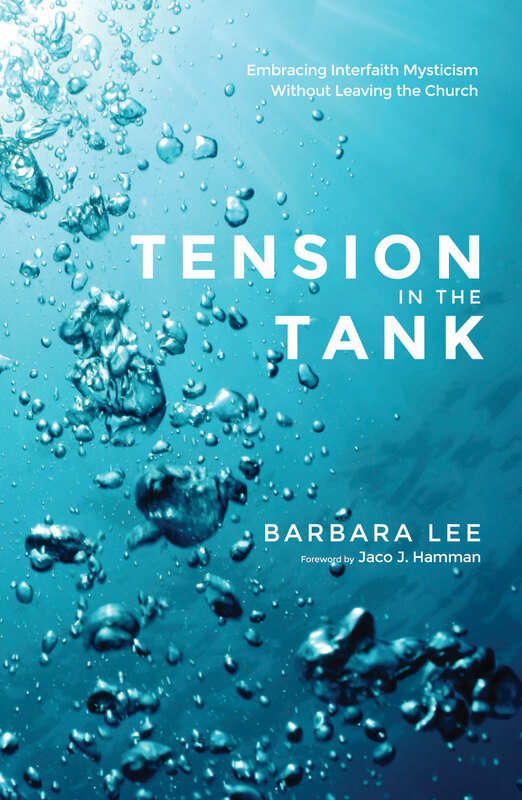 Tension in the Tank also serves as an important resource for pastors and lay leaders who wish to remain faithful to their religious roots while assisting parishioners with the questions they raise and the challenges they face. 2) What do you mean by “Interfaith Mysticism”? There is a growing hunger in our culture to explore truths revealed by God to other cultures in other times. More and more I find myself speaking with people who consider themselves Buddhist and Christian, Hindu and Christian, and so on. Usually these statements come from those who have left Christian community in order to pursue their spiritual path. There is a deep desire within an increasing number of people to recognize that truths exist in other faiths, and a feat that those sharing those beliefs make them outcasts and outsiders in any Christian church. Sadly, many people have made the painful decision to abandon their own Christian lineage in order to live out their new understanding of God, even as it was Christ who opened them up to see those truths in the first place. Tension in the Tank invites readers who are Christian to stay rooted in their own lineage, while being introduced to healthier translations of Christianity and other sacred teachings that are ultimately aimed at Spiritual transformation. 3) What is a mystic? A mystic is anyone who has a direct experience of God. We are all mystics if we pay attention to the experience. 4) Does spiritual growth require staying in the church? The church is not necessary for anyone’s spiritual health or growth. But staying in the church can serve the important purpose of providing community. The need for community is in our blood. Human beings throughout all of history have formed themselves into clans and tribes. It is only in our relationships with others that we define who we are. It is in community then that we find our identity. It is in community that we gain a sense of purpose and accomplishment. We need such a group, such a place of belonging—today perhaps more than ever, as we struggle with the realities of broken community, fragmented society, and disrupted family systems. 5) What do you hope people will gain from reading your book? I hope they will find a place of welcome in a faith tradition that inadvertently creates exiles. And I hope people who are still engaged in the church and bothered by their own questions and doubts will feel permission to embark on their own faith journey without being tied to anyone else’s expectations of what that journey should look like. 6) What are the sources of “tension” in your own life that keep your faith “vibrant and alive”? I am surrounded by people who regularly challenge my faith in myself and in my worldview. They include my children and my significant other. The work I do in the nonprofit sector keeps me actively engaged with people who live on life’s margins and who shine the light on the realities of the disadvantaged in our society. I cannot connect compassionately with their needs without continually revisiting and reshaping my understanding of this world and my tentative understanding of the great unknown. I also engage in local and international service as a way of putting my faith into concrete action while making it impossible for me to deny or ignore the needs of all creation. Finally, I stay attuned to the political landscape and engage in the political process to do my part in creating a more just society and world. 7) How is this book different from other progressive Christianity books on the market today? Tension in the Tank differs from the majority of Christian literature in that it offers a liberal interpretation of scripture and applies that interpretation to the real world in which each of us lives and breathes. It does not simplify or romanticize the journey of faith. Often readers have to choose between Christian literature that appeals to their roots but maintains an arrogance about Christianity’s superiority to other religions, and non-Christian literature that invites a more expansive embrace of spirituality at the cost of leaving behind or even severing one’s Christian roots. Tension in the Tank achieves the perfect balance of celebrating authentic Christianity as one way to experience God while also providing insight into other faith traditions and practices that also lead to the direct experience of God. The one thing I am certain of is that whatever my image of “God,” it is not God. 8) Is Christianity as a whole moving toward or away from acceptance of other faith traditions? The popular media has often turned to the voices of fundamentalist Christians for sound bites and provocative news stories, particularly as so many issues are being raised regarding religion and politics. Recently there has been an attempt to blur the line between Church and State in order to advance conservative religious and social ideals. This has led many with the sense that they are alone and isolated on their interfaith journey. However, other voices, such as Pope Francis are working to remove those barriers and establish relationships with those of other faith traditions, and those who practice no religious faith at all. This voice is being well received and will give courage to more people to engage in interfaith relationships. 9) What do you think of God? Tension in the Tank replaces the notion of a male parent deity with the proposition that God is not a superhuman being who somehow exists outside of our life, but that God is instead the inescapable depth and center of all that is. It challenges the reader to begin to conceive of God not as a being superior to all other beings, but as the very Ground of Being itself. There is a spiritual hunger in our world today, a hunger for God that is so deep and pervasive that people are seeking out New Age web sites and book stores, and flocking to the theatre to consider the potential truths behind movies like the Truman Show and the Matrix. This is not a hunger for the traditional church or the answers the church has traditionally given. But it is a hunger that can be satisfied as we explore our ancient faith through the eyes of Jesus Christ in the context of the twenty-first century. Transformation is about change. It means following Christ in such a way that we die to our old selves and are reborn, not just at Baptism, but over and over again. And frankly, not too many people get really excited about dying. So we spend most of our time doing religion rather than living our faith. Religion in this culture is by and large about translation and interpretation. It is about rules and doctrine and order. To preserve those rules, that doctrine, and that order, we have developed religious institutions. And of course the very nature and purpose of institutions is stability. The goal of any institution is to not change, not transform. Translation is important. Most of us have heard some really horrible comments made in the name of Christianity that have hurt and alienated us and others that we love. We need to address those teachings and that kind of spiritual violence while offering the life-giving word of grace. Most of us have also heard a theology of glory: If we have enough faith we will be blessed. As we struggle with illness and poverty and broken relationships and discrimination we need to know that the cross is testament to God’s presence in the midst of our suffering; that we are never abandoned or outside of God’s reach. And in this culture that is so often preoccupied with selfishness and violence and greed we need to be continually challenged by Jesus’ mandate to sacrifice, surrender, and love for the sake of others and for the sake of community. These are undeniably important conversations for us to have, and they are conversations that should bring about deeper spiritual understanding, action, and growth. But at some point we need to recognize that these philosophical and psychological debates, these mental exercises and physical exertions, as necessary as they are, are not ultimately about transformation. Ultimately, transformation requires us to let go of our certainty and abandon our knowledge in order to experience greater intimacy with God. Transformation is, in one understated word, uncomfortable. Broken people know this, and they want to be transformed anyway. They know the depth of their need and they long to be changed. We are broken people. Do we know this? Or have we forgotten? At what point do we who follow Christ actually feel comfortable saying the words, “I’m comfortable where I am”? Perhaps we want too quickly to escape the trials and tribulations of this material world. For most of us it was in deep physical and emotional misery that we began to be transformed. But who wants to invite in physical and emotional misery? It is not a natural instinct. But what if the sacrifice, the surrender, the death we have experienced is a call to move beyond the material distractions of our world and our self? Without discomfort will we continue on our journey? When the broken bones of our life are healed, will we rest in peace? Or will we continue to seek healing for our broken souls? When we meet each other on the journey, will we be content to help set each other’s broken bones or will we find the courage to push against the hidden bruises of each other’s souls?